But soft!—What light through yonder window breaks? It is the east, and just look at that adorable friggen sun! Obviously Shakespeare went through several revisions in all of his plays, especially the ones that would come to be known as some of his best of dramatic tales. Still, you can’t argue with some of those original poetic phrases. It is time once again to start working on those lines to stand up for an audition in an attempt to land the most prestigious of roles in the play. Will your tyke be the joyous and full-of-mirth-and-wisdom Mercutio? Or perhaps the curiously helpful apothecary that just seems to understand what it is like to be a young couple in love? Perhaps the fire-hearted Romeo who always seems to be just a couple seconds behind in the grand plan? Of course not! For you are here, looking at this page, so you obviously know precisely where your darling is going to land in the casting! 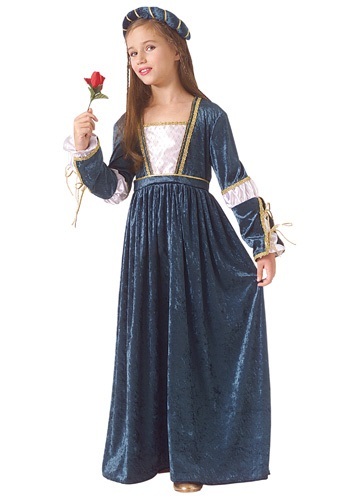 It is time to show the world just how friggen adorable your tyke is with this Child Juliet costume. This crushed velvet pullover dress has a square neckline with varying design in the mesh-covered satin bodice and matching arm bands. The dress itself has brilliant gold-braid trim to show the perfect balance of elegant nobility and down-to-Earth grace. The matching stuffed crushed velvet circlet makes for a lovely hat that will still show off your kiddo’s lovely ‘do. Now we just need to get those lines down and this star-crossed tyke will be all star. Nicely made costume for the price. Great service. The color is royal blue, not navy as pictured, but is very pretty. 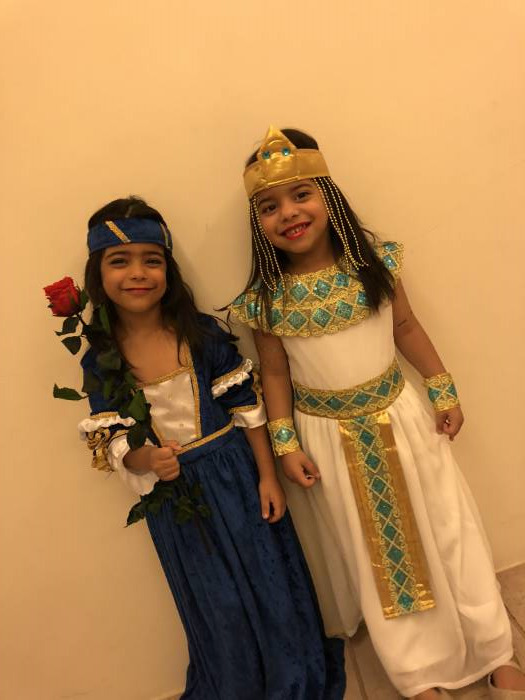 My daughter loved it for her Brave party. The size was perfect. got a small for a 42 in. girl and it touched the ground. Really nice dress for the price :) 2nd level Shipping was really fast too.